In the normal course of events, one has a couple of chances to have a look at a young Bordeaux vintage, both opportunities being organised by the Union des Grands Crus de Bordeaux. The first nibble of the bunch occurs in late March/early April when the world descends on Bordeaux to have a look at the insanely, criminally young wines that have, at that stage, not long finished their malolactic fermentations. It is at this time that the planet's wine trade has to decide on what to sell to its customers that vintage. 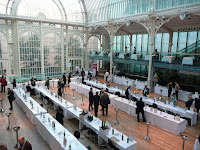 The second examination occurs October and has for some years been held in the Paul Hamlyn Hall at the Royal Opera House. It's a worthy venue: light and airy; not too hot, and before last year (when the '05s were shown) there always seemed to be enough room to circulate with relative ease. Now it feels as though each merchant brings along their entire complement of personnel and, although one now has to elect for either a morning or an afternoon session, the place is still akin to Shibuya Crossing in Tokyo at 18h00 on a Friday evening. This second tasting is rather more illuminating than that in Bordeaux. The wines have been bottled; they are more finished, more representative. Their charms (or otherwise) are easier to discern. So what about these '06s? Did yesterday's taste-athon provide new insight? Well, yes and no. What it certainly confirmed was that '06 was a difficult vintage of highs and lows, the extraordinary fact of which was that it was possible to produce something or real merit; there were present yesterday wines of great purity, excellent concentration and classical structure. Just not many of them.